We are a well known name in designing and developing Exhaust Clamps. These are made as per the client's specifications and requirements. These are clamps are at par with international quality standards. 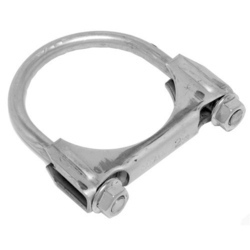 We offer a wide range of very high quality Exhaust Clamps to our customer. These products are manufactured using very high quality Galvanized (Zinc Plated) materials that are sourced from very reliable vendors. These products are widely used in automobile industries owing to its superior quality and long lasting performance. These products are offered with uniform sheet thickness and wide range of sizes that best suits the requirement of our trusted customers. Looking for Exhaust Clamps ?